NEW YORK (AP) Over five seasons as ace of the Pittsburgh Pirates, Gerrit Cole threw one of the game’s hardest, heaviest fastballs, and he threw it often. The pitch helped him make millions of dollars. It put him in contention for major awards. Hitters swung through it again and again, and Cole seemed content not to mess with a good thing. But when Cole was traded to the Houston Astros this offseason, a funny thing happened. He became more frugal with his fastball and ended up more overpowering than ever. Cole has joined some of the game’s best pitchers – including Cleveland’s Corey Kluber and the Dodgers’ Clayton Kershaw – in benefiting from a puzzling baseball paradox: In an era when pitchers are throwing harder than ever, they’re maximizing success by using fewer fastballs. Pitchers – even ones with blazing fastballs like Luis Severino and Chris Archer – are using more offspeed than ever recorded, and while many aces think the downturn is a trend, some believe baseball could be entering a new age dominated not by 100 mph heaters, but by a steady stream of breaking balls and changeups. So why is the hardest-throwing generation of pitchers ever going the way of the junk-baller? Depends who you ask, but one culprit stands out to Cole, Kluber and Kershaw: baseball’s swing-changing batters. Cole’s move away from a fastball-first approach is striking given the reputation of his hardest pitch. He topped out at 99 mph as an ace at UCLA, and his fastball was the headliner on a resume that earned him an $8 million signing bonus as the first overall draft pick in 2011 by Pittsburgh. Under the guidance of Pirates pitching coach Ray Searage, Cole pounded the bottom of the strike zone with that heater, and for years, it worked. 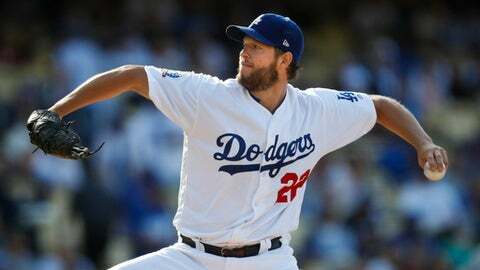 He was an All-Star and finished fourth in NL Cy Young Award voting in 2015, and was considered among the game’s most overpowering starting pitchers. Then baseball’s flyball revolution took flight – a movement of hitters using upper-cut swings designed to crush exactly the kinds of sinking fastballs Cole was delivering. After never allowing more than 11 home runs in a season, Cole was tagged for 31 last year. So it was time to change things up. From 2013-17, Cole threw his fastball 65 percent of the time – well above the league average. But this year, he’s cut that fastball rate by about 10 points, replacing those heaters with sliders and curveballs. The new look is working. Cole is 8-1 with a 2.59 ERA through 15 starts and leads the American League with 138 strikeouts. Kluber and Kershaw have made similar adjustments in the past couple years. Both Cy Young winners rank among the league leaders in fewest fastballs thrown this season. Kluber has set a career low with a fastball rate of 41.8 percent this season. Same for Kershaw, who has dropped from a 72-percent fastball clip in 2010 all the way to 42.8 percent in an injury-hampered 2018. Cole, Kluber and Kershaw suspect the tide will turn back, perhaps soon, once hitters recalibrate to the number of four-seam fastballs pitchers are throwing up in the strike zone. But Trevor Bauer, Kluber’s analytically-minded teammate in Cleveland, thinks the offspeed uptick is only going to spread. Two years ago, Bauer and Indians closer Cody Allen watched as 6-foot-8 Yankees fireballer Dellin Betances carved up Cleveland’s hitters with a fastball that averaged 98 mph. Allen – no slouch himself with a fastball around 94 mph – told Bauer that if he could throw hard like Betances, he wouldn’t even bother with a breaking ball. Bauer’s theory is that the threat of a 100 mph fastball might be more dangerous to hitters than the fastballs themselves. Hitters are left picking between two nasty poisons – risk being behind on triple-digit fastballs, or jeopardize taking ugly swings on breaking pitches as they dart out of the strike zone. Veteran slugger Todd Frazier was with the Yankees last year when New York’s hard-throwing bullpen led by Betances, Aroldis Chapman and Chad Green overpowered hitters while also posting the lowest fastball rate in the majors. And yet, Frazier and his fellow hitters aren’t close to jumping off their fastball-first approach. Bauer has hypothesized for years that as velocities climb, pitchers may benefit from throwing fewer fastballs, but he didn’t fully embrace the shift himself until this year. After a 2017 postseason in which Houston’s Lance McCullers Jr. (40 percent fastball rate in 2017) and the Yankees’ Masahiro Tanka (26.4 percent) thrived with low fastball rates, Bauer has finally followed suit. It’s no coincidence to him that he’s having the best season of his life. Bauer has thrown his four- and two-seam fastballs less than 40 percent of the time this year – about a 10-point drop from his career average – and filled that gap mostly with sliders. He’s baffling hitters like never before, ranking among the league leaders with a 2.50 ERA and 129 strikeouts – second only to Cole in the AL. That 40-percent clip puts Bauer among the most infrequent fastball throwers, but he thinks the rest of the league may soon catch up by slowing down. Since pitch-type data was first recorded in 2002, the rate of four- and two-seam fastballs has shrunk steadily from 64.4 percent to 55.4 percent, according to data logged by Fangraphs. Meanwhile, average fastball velocity has risen from 89 mph to 92.6. If the heat keeps getting hotter, Bauer thinks pitchers will cool it further on the fastballs. After all, other hurlers are going to notice the success that Cole and Bauer – former UCLA teammates – are having with the adjustment this season. Bauer suspects the league-wide fastball rate could drop as low as 40-45 percent before hitters finally adjust. ”You trap the hitters, basically, if you take that approach,” Bauer said. What do the hitters make of all that? Freelance writer Olivia Sandusky in Los Angeles contributed to this story.